Teaching Human Evolution at a Public University in Boston – Patrick F. Clarkin, Ph.D.
An article published this week in Science revealed the results of a survey of 926 U.S. high school biology teachers. The authors, Michael Berkman and Eric Plutzer of Penn State, found that only 28% of teachers “unabashedly introduce evidence that evolution has occurred and craft(ed) lesson plans… that evolution is a theme that unifies disparate topics in biology” (Berkman and Plutzer, 2011). 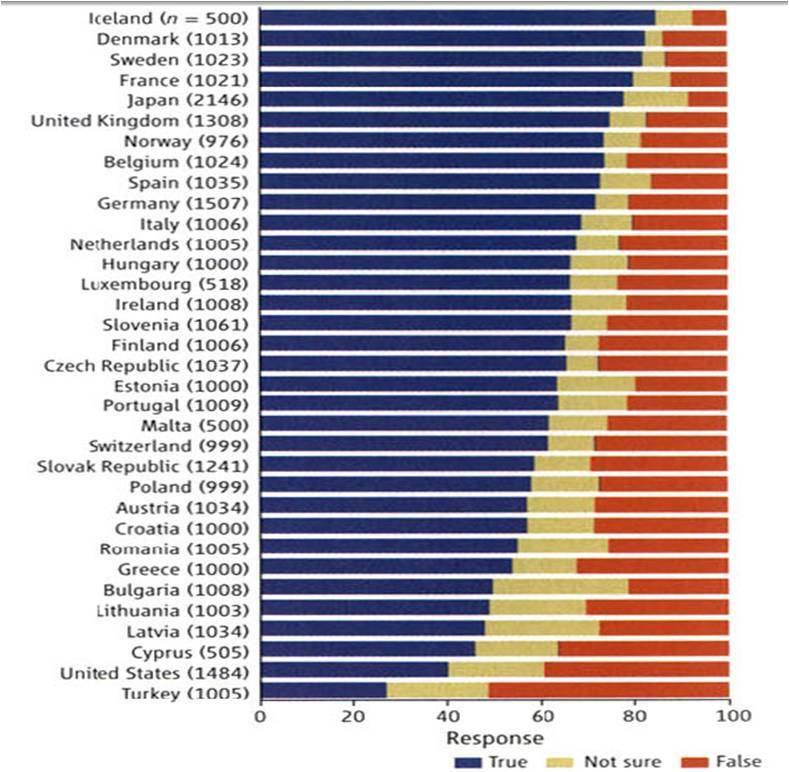 Shockingly, 13% of teachers advocated creationism or intelligent design in the classroom, but most (who the authors termed “the cautious 60%”) were “neither strong advocates for evolutionary biology nor explicit endorsers of nonscientific alternatives.” The authors suggested that the ambivalence of some biology teachers could be due to a lack of confidence in their knowledge of evolution, a desire to shy away from controversy, or a conviction that students should be exposed to various ideas and then allowed to make up their own minds. These numbers should make biology teachers pause and reflect on where we are as educators, 150+ years after Darwin’s publication of On the Origin of Species. Internationally, the percentage of the U.S. population accepting human evolution remains quite low compared to other developed nations (Miller et al., 2006; see graph below). Those who teach evolution in the U.S. are acutely aware that it remains a controversial topic with the general public (although not among biologists). That reality cannot help but seep into the classroom. A 2010 Gallup poll found that 40% of Americans believed that humans were divinely created in their present form within the last 10,000 years, which is actually a significant improvement from 47% ten years ago. However, for those who accepted that humans had evolved, 38% felt that God had a guiding hand in the process, while only 16% favored a strictly naturalistic view. That itself is a very interesting notion, and is indicative of a rather anthropocentric bias. For many people, the objection may not lie with evolution per se, but perhaps with the notion of viewing human existence as anything other than inevitable and exalted. No doubt, those who accept a guided, theistic version of evolution would have a problem with Stephen Jay Gould’s famous thought experiment on the contingent nature of our existence: “Wind back the tape of life, and let it play again. Would the replay ever yield anything like the history that we know?” (1990: 188). As someone who regularly teaches classes related to human evolution, I am particularly sensitive to this topic. In upper level classes, we do a quick review of the evidence for evolution in the first week and build from there. However, at the introductory level we take a different approach, since students are enrolled for various reasons and have widely different personal and academic backgrounds. In fact, as the only public university in the city, the diversity of UMass Boston students is one of the reasons I enjoy teaching here. But it is important to know from the outset where they are coming from. 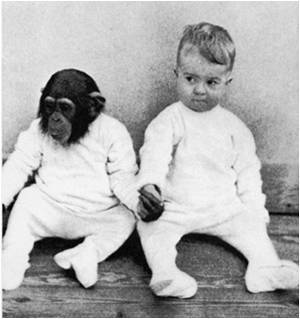 Most students have certain subjects for which they feel a special affinity or aversion. Occasionally, in class or office hours, a student will say something like “I was never good at science” or “(science/math/other) is evil.” Of course, when they use the term ‘evil’ in this context, it is facetious and merely to convey that they haven’t had much success with it in the past. Few subjects, however, have the potential to be considered to be evil in the literal sense, as evolution sometimes is (erroneously). It is a rarely expressed sentiment here in Boston, but it has popped its head up a few times. Even for those students who aren’t adamantly opposed to the subject, evolution is sometimes stigmatized as controversial because of something they’ve heard at home, in the media, or some other means of memetic osmosis. Obviously, this can present a special challenge when teaching the subject. At the beginning of each semester that I teach “Introduction to Biological Anthropology,” one of the first things I do is distribute an anonymous, one-page questionnaire to the class. This helps me get a feel for student motives for taking the class, their expectations for the semester, and their perceptions of evolution. In the next meeting, we look at the results as a class. Consistently, two-thirds of students indicate that their primary reason for taking the class is to fulfill their natural science requirement (the other third are either majors or taking it as an elective). For many students, fulfilling their NS requirement through biological anthropology is a less intimidating route than a course in physics, chemistry, or straight biology. In fact, many students are not even sure what anthropology is. Those departments’ loss is our gain, however, and I see this as a chance to teach something really important about how science operates, the fossil record, primate behavior and anatomy, and human biological variation. Throughout the semester, evolution is the thread that ties everything together. 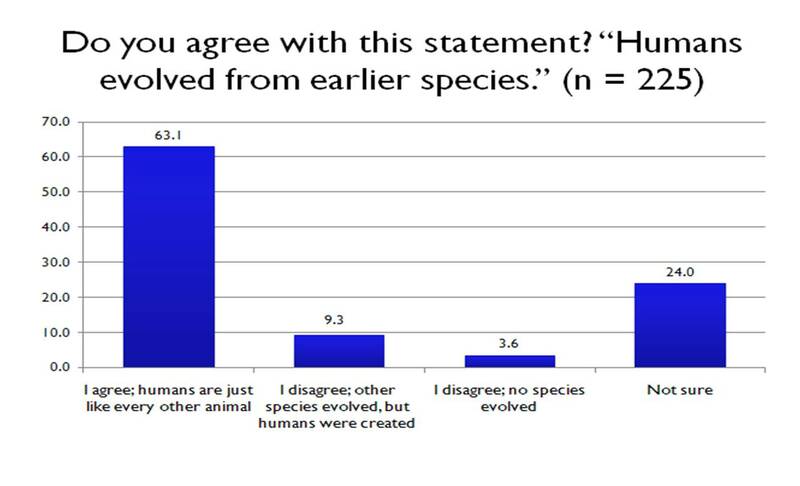 One of the more interesting survey results from my classes pertains to student opinion on human evolution (below). Over multiple semesters (n = 225), 63.1% of students agreed that “humans evolved from earlier species.” This acceptance rate of human evolution is higher than national rates mentioned above, as should be expected since this is correlated with younger age and higher education. But what is particularly intriguing is that 9.3% were willing to accept the general notion of evolution, with the exception of human beings. For many people, this idea is too close to home. It is not my role to ‘convert’ my education students, but to lay before them the difficult choices that they must make for themselves. For creationist and/or relatively scientifically ignorant students, this certainly means trying to teach them in the most effective possible way about evolution and the strong evidence on which it is based. But for students (or teachers, or teacher educators) who have always had a strongly scientific cast of mind, this means raising their consciousness about the very real reasons that “those other people” exist and probably will continue to do so, both among their students and among their colleagues” (Jackson, 2007: 172). Evolution is a fact. Beyond reasonable doubt, beyond serious doubt, beyond sane, informed, intelligent doubt, beyond doubt evolution is a fact… No reputable scientist disputes it, and no unbiased reader will close (this) book doubting it” (2009: 8-9). However, I know it isn’t that way for everyone, and getting there is an intellectual journey. Biologist Ken Miller of Brown University, who is a strong advocate of evolution and a practicing Catholic, has argued that for many people who are unwilling to accept evolution, the primary motive is not a dispute over the evidence, which is vast and ever growing. Rather, it often comes down to a reluctance to relinquish one’s cherished worldview, usually built on a religious foundation (also see: Miller, 1999). As humans, we have a tendency to avoid making radical shifts in thought in a short span of time. For whatever reason – stubbornness, or simple inertia – a schism from one’s basic worldview is psychologically and emotionally taxing, no matter how convincing the evidence is that we should reconsider our original position. I know this firsthand, having grown up fairly religious myself. Ultimately, what made science and biological anthropology enticing to me as an undergraduate was knowing that despite our human limitations, we CAN use scientific principles to figure out some pretty cool stuff, such as where we come from, why skin color varies among humans, and why we are genetically and anatomically similar to other apes (and other life). Understanding ‘why’ is a powerful, uplifting, and deeply satisfying message to offer our students. Though this may go beyond our charge as educators, I think it’s also important to show students that biologists believe that life is beautiful too. Evolution is not bleak nihilism. To me, the fact that the fossil and genetic evidence points to our species’ recent appearance on an ancient planet leaves me feeling awed and inspired, not degraded, at what we can know and how far life has come. We don’t know everything. We are only naked apes, after all. But even though we are fallible animals with finite intellects, what amazing apes we are. Darwin CR. 1859. On the Origin of Species by Means of Natural Selection, or the Preservation of Favoured Races in the Struggle for Life. John Murray. Dawkins R. 2009. The Greatest Show on Earth: The Evidence for Evolution. Free Press. Dennett DJ. 1995. Darwin’s Dangerous Idea. Simon & Schuster. Gould SJ. 1990. Wonderful Life: The Burgess Shale and the Nature of History. Norton. Jackson DF. 2007. The personal and the professional in the teaching of evolution. In Jones LS and Reiss MJ (eds. ): Teaching About Scientific Origins: Taking Account of Creationism. Pp. 159-78. Miller K. 1999. Finding Darwin’s God. Harper Collins. Miller JD, Scott E, and Okamoto S. 2006. Public acceptance of evolution. Science 313: 765-6. This entry was posted in anthropology, Creationism, Evolution, Teaching. Bookmark the permalink. ← One Planet. One Species. Homo sapiens. What a great post! I especially liked where you brought in Ken Miller — I think that’s a good perspective to hold when dealing with students who are suspicious or slow to accept evolution. I wonder if you have any strategies to offer for how to discuss these things in the classroom to build the confidence of students who are not scientists or science majors. I teach a large non-major class like you, and encounter similar issues. Hi Kate, thanks for the kinds words. I also like Ken Miller, and though I don’t agree with him on everything, he’s sincere in his beliefs and his writing is a good way to bridge the divide for some people. I’ve tried to take a big picture approach at the intro level, while not skimping on the details, and remind students to ask themselves “why is this important?” (maybe it is to them, maybe it’s not). Why should we even care about science and anthro? Hopefully, that gives students a scaffolding that they can build upon throughout their education and beyond. I don’t know how well that works. Every so often, former students will email me about some anthro-related story they came across in a magazine or online (probably in one of the awesome blogs out there). At the end of the semester, I tell them that it would be nice to have a conversation with them about anthro or evolution if we were to bump into each other in the future. Hopefully they retain some of this stuff and regard it as more than esoteric. Plus, you and I are kind of lucky that we get to talk about human evo and biology because that’s ultimately about something most people are interested in- ourselves. Terrific, inspiring post, Patrick. Thanks also for pointing out Greene’s essay on teaching. I’d love to hear more about any specific approaches you take in class that seem effective in cultivating students’ awe and curiosity. Hi Lance, Thanks very much. Incorporating visuals and video clips help a lot. Youtube can be a good resource. Any tips you, or anyone out there, could share? I’d love to hear them. Really, really well done, Patrick. I’ve shared this via the AiP Facebook page, and it’s already circulating among my teaching peers. You really make good use of Miller, and I applaud the fact that you’re willing to introduce your own religious background to emphasize your understanding. Hi Krystal, thanks for linking to this on AiP. Glad you thought it was worth sharing, and it’s being read by others. I read this based on Krystal’s recommendation, and I really appreciate your approach. The Dawkinses of the world close as many minds as they open, since their philosophy boils down to “If you don’t agree with me, you’re an idiot,” which does not win friends and influence people. Hi Wendy, I agree that the confrontational approach is really off-putting to most people. Dawkins may be an acquired taste for some, depending on which version of him they see. Perhaps consider giving him another chance. I’m not an anthro guy so I don’t have the same insight and background as most other people commenting. I did however take this intro to biological anthropology class and I can say that it is an amazing course. I think it should be a requirement and not just because it points to the obvious, that being that evolution is real and there’s evidence that proves it, but also because it has an underlying message to it. At least I saw an underlying message that says “don’t just believe something because someone told you. Go see for yourself and let your findings, the evidence, tell you as to whether or not something is real” I think this class should also only be taught by you or you should at least create the framework of how it ought to be taught. You made it fun and exciting and I’d totally take it again. I feel like I got much more than the NS requirement out of it, and if I had taken it earlier in renewed college career I just might have gotten back into the sciences.